For hiking fun and adventure, few can rival Mount Diablo. With the most viewable surface of the Earth, many trails, camping, horseback riding, and other amenities, Mount Diablo is one of Northern California’s most enjoyable state parks. This article will cover most of the highlights of the wonderful mountainous park located near the Bay Area. Details are given on hiking, camping, hours, cost, and where to find out more information. If you’re looking to enjoy an outdoor adventure in California, consider Mount Diablo. In the San Francisco Bay Area is Mount Diablo. Named for a skirmish in the early 1800’s when a group of Spanish soldier claimed to have retreated from the Devil himself (a.k.a. Diablo), the park features many different attractions. At a height of 3,849 feet, the park has many trails for hiking. Horseback riding, biking, and camping are also some of the more notable features. There is one major attraction to Mount Diablo: The peak. Hikers will not only enjoy the journey; they will also enjoy the destination. 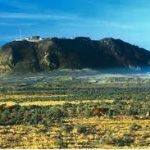 The official website of Mount Diablo claims that it is the one point in North America where you can see more of the Earth’s surface than anywhere else. The only other place in the world to claim such a feature is Mount Kilimanjaro in Africa. If you enjoy hiking, you’ll appreciate one unique aspect of getting to the peak of the mountain. As you climb, the rocks become older. This is in direct opposition to the normal experience of other mountainous terrain where the older rocks are at the bottom and the successive trail follows along relatively newer surfaces. This is because the rock has been upturned during its formation and pushed upwards. Hikers who are more interested in the adventure than the geology will still enjoy the wildly shaped and wind-blown rock formations along the hike. There is a notable formation near the picnic area called Rock City. There is another formation called the Devil’s Pulpit which has been called satanic in appearance at the bottom of the summit. Within Mount Diablo, there are 56 campsites. Amenities include hot showers and flushing toilets. The maximum size of RVs is 20 feet. Because of road conditions, it is not advisable to bring trailers for camping. For those seeking to camp with a group, special sites are available with running water and pit toilets. Facilities for horses are also available at selected camp sites. Mount Diablo State Park opens at 8:00 AM and typically closes when the sun goes down. The park advises visitors to be in their vehicles and ready to leave by sunset otherwise they will be locked inside the park. From 10 AM to 4 PM, the visitor center is open 7 days a week. There is also a museum at the peak of the mountain with the same hours. To learn more about Mount Diablo State Park, visit the official website. The website includes current weather conditions. It also has information about the park’s status. Online reservations are available for those planning their trip in advance. The fees can change depending on several factors. It is best to contact the park ahead of time to determine how much it will cost.